Do you like gravy on your fried chicken? If you do, Jimmy’s Diner in Williamsburg is for you. 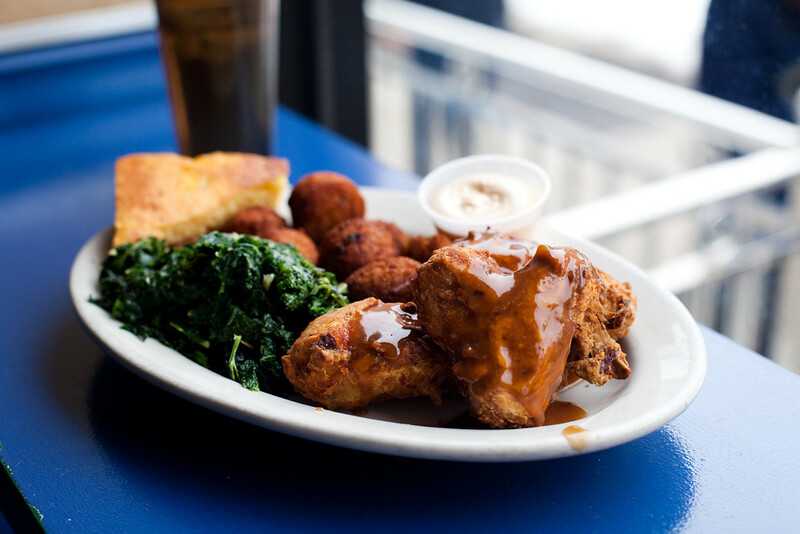 Situated just couple blocks from McCarren Park, Jimmy’s Diner is a Brooklyn style southern diner serving disco fries, steak and eggs to breakfast bowls that put things like tater tots, onions, cheese, guac and scrambled eggs into a bowl. Those all sound quite delicious but I was here for the fried chicken. At Jimmy’s Diner they serve chicken and waffles topped with country gravy ($13) and a fried chicken platter with brown gravy plus 2 sides ($13). Instead of going twice, I did the smart thing and took a friend with me. They love gravy at Jimmy’s Diner. I understand having country gravy over the fried chicken and waffle but gravy on the platter as well? I like gravy but sometimes restaurants make theirs way too heavy and that just adds onto the heaviness of the fried chicken. My friend and I both agreed that the gravy did little to the fried chicken and overall both plates were just okay. The pieces of chicken were crispy and juicy but kind of bland. The waffle was good, crunchy outside with a chewy inside. Probably the best bite were the homemade tater tots which were more like croquette balls. Overall, I wouldn’t mind going there again if I live in the area but definitely wouldn’t travel from Park Slope to Williamsburg for the fried chicken.